Kids awake, brimming with energy and awesomeness. Parents arise, groggy, potentially irritable before the coffee infusion. Kids want to play/fight/whine/negotiate. Parents want them to get dressed. Kids want to play/fight/whine/negotiate. Parents want them to eat breakfast. Kids want to play/fight/whine/negotiate. Parents want them to brush their teeth. Kids want to play/fight/whine/negotiate. Parents want them to get their backpacks ready, shoes and coats on. Repeat over and over and over and over. Tick, tick, tick. Parents check emails, tweets, FB posts …. distraction. Where are my library books? Oops, I forgot to do my homework. Do I have lunch money? Honey, can you pick up the kids tonight, just realized I have a meeting? Repeat Monday, Tuesday, Wednesday, Thursday, Friday. In December 1985, I fell in love. No, this wasn’t when I met my husband-to-be or gave birth. It was when I saw Les Miserables on the stage for the first time, the very week it opened in London’s West End. Row D in the stalls. I’ve always enjoyed musical theatre. I’d been fortunate enough to see most of the major shows from Annie to Evita to Phantom to Chicago and many, many others. But as I sat there, experiencing Les Miserables for the first time, it was a watershed moment for me. I was struck by how I could understand every single word of every single song. I was awed by the incredible talent of every single member of the large cast; any one of them was talented enough to take the lead roles. The staging was remarkable, innovative. I was thunderstruck by talent of Colm Wilkinson who played Jean Valjean. I fell head over heels in love with Michael Ball, who played Marius. I wanted to be Eponine, played beautifully by Frances Rufelle. At its core, the genius of the score delivered a tapestry of harmonies that effortlessly weaved together making an imprint on your mind and heart, one that would stay with you for days and weeks and years. Fast forward almost 28 years (how is it possible that I am that much older?) and the release of the movie version of Les Miserables. The anticipation was thrilling. But when I took my seat in the cinema, I have to admit to being nervous, so scared of being let down and disappointed. After all, the memory of the stage show had made such a significant mark on me. How could this possibly compare or exceed? Two and a half hours later, I emerged, high once again on Les Miserables. The movie was a masterful adaptation from the stage to the silver screen, glorious in its production, stark in its cinematography, with powerful, in-your-face performances that were raw, moving and penetrating. I wept: fat, hot tears rolling down my cheeks, over and over. I applauded at the end. All that night, phrases from songs wove their way into my dreams and I woke up humming. They are still with me, their melodies and lyrics skimming the edge of my consciousness. Hugh Jackman and Anne Hathaway’s performances were stunning, Oscar-worthy. Known first and foremost as actors, their vocal deliveries surprised with unanticipated talent. It’s been well-documented how their performances were filmed live, in one take, on-set—and the net result was remarkable, setting a whole new benchmark. The only disappointment was Russell Crowe. Sure, the man can act. Yes, he can kind of sing. But unlike Jackman and Hathaway, he couldn’t do both at the same time! And Eddie Redmayne was no match for Michael Ball’s Marius—not even close—but his “Empty Chairs at Empty Tables” was perhaps more visceral. What was even more righteous was that Colm Wilkinson and Frances Ruffelle—protagonists of the original stage show—had parts in the movie: the bishop and Whore #1, respectively. Yesterday my husband surprised me with the CD soundtrack from the movie. I eagerly listened, seeking to recapture the marvel. But I quickly realized that decoupling the vocal performances from the on-screen performances was a mistake. The flaws in the actors voices were heightened. Without the imagery, they lacked impact. By contrast, when I listened again to the soundtrack from the original stage cast, I was struck by how pure the performances sounded, how ‘staged’ and lacking in drama. But no matter. I have fallen in love, all over again with Les Miserables. Whether the movie is your first encounter with it, or you experienced the stage version, there’s no denying that Victor Hugo, Claud-Michel Schonberg, Alain Boublil, Cameron Mackintosh and Tom Hooper are creative geniuses to whom I am forever indebted. I may gush. But I dreamed a dream. And it was worth it. Not every working Mom wipes the snot off her shoulder, slaps on some lipstick, ruffles her Mommy hair and heads off to an office every day (but if she does, here are 20 ways to spot her.) 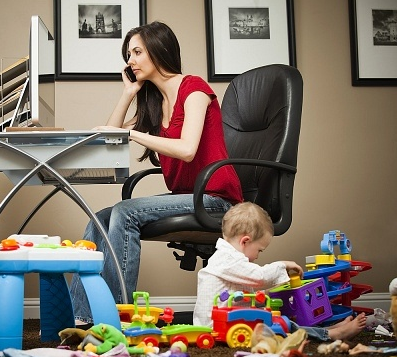 Many Moms are lucky enough to work from home. Flexible hours. No commute. Serenity. Productivity. Right? A lot of the time, yes. But not always. Whether you are working around your kids’ school, snack or nap schedule, or stuck at home on a snow day or with a sick kid, the truth is that kids and conference calls just don’t mix well – much like oil and water. Try delivering a presentation over the phone, actively participating in a meeting, taking notes, or answering an important phone call from a client with a kid—or worse, kids—in the same room. Because the second you turn your back, speak up to make your point or try to focus, chaos, hilarity or whining inevitably ensues. It’s that sixth sense that kids have, knowing precisely when and how to exact the most torment. I remember a few years back, stuck at home on our fifth snow day, participating in back-to-back conference calls and meetings with two kids suffering from cabin fever and excessive TV exposure. By this point, I had tried every possible form of entertainment, distraction, bribery and threat. I was literally in tears, weeping and begging them to leave me alone with promises of chocolate, new toys, trips to Disney—anything to get them to go the eff away so I could get some work done. It wasn’t pretty and I wasn’t proud but such is the reality of working Mommihood sometimes. How about giving my son my iPad to play games while I worked on his sick day…until he downloaded $250 worth of upgrades to his games. To be fair, he didn’t know – it kept asking him if he wanted to purchase and he couldn’t read but he knew the word yes and he could see he got more coins to get better cars. 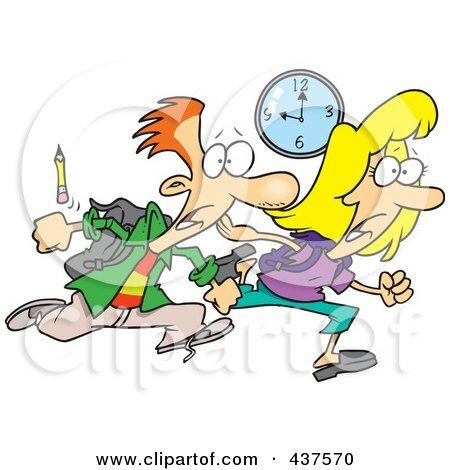 I remember my husband got held up in a meeting at the end of the day and I had to lead a hastily scheduled, late day, project kickoff with a client. I gave them coloring books and put on a show and a load of other things to keep them busy – all of which did not hold their interest. I vividly remember having to lock my door while they were banging on it and yelling my name to come help with something. It wasn’t long – maybe half hour tops – but I came out to my then 18 month old painting on the wall and my almost 5-year-old climbing on the kitchen counter to get a snack with crackers all over the floor. I’ve been on the phone with patients with 3 kids screaming in the background … to the point where I had to put the baby in her playpen and lock myself in my room. So much for “having it all”, eh? What stories do you have to tell? Please share and let’s get all confession-y together. I love how they can hold my kids’ attention for 20+ minutes at a time, sometimes even longer. I love how my son intensely follows the directions to create fantastically-complicated Lego masterpieces, often within minutes of receiving them as a birthday or Christmas gift. I love how my daughter uses her imagination to create Lego dogs and cars and robots. I love how my son easily improvises, building complex, freeform Lego machinery, transportation and weaponry. I love how Legos engage both sides of their brains. I love the Lego store: not the prices, but rather the fun of the monthly Lego club, where kids work together to complete a Lego challenge. I love the monthly Lego magazine because my kids love reading it. I love how, when playing with Legos, my kids are not wrestling, squabbling over the iPad, whining for whatever, spilling milk, watching TV, writing on walls (OK, they don’t do that anymore), attempting to launch themselves off of furniture … and so on. You get the drift. I hate that they are everywhere. Freaking everywhere! I hate that, as my kids get bigger, the Lego pieces get smaller and more numerous. I hate that Lego pieces have this way of breeding, like little horny plastic bunnies—and then liberally distributing their spawn over every surface of my home. Not to mention everyone’s “favorite”: unexpectedly treading bare-foot on a Lego piece. (I’ll bet many a child has learnt some colorful new vocabulary from their parents every time it happens.) I hate that a “quick” visit to the Lego store turns into a painful, drawn-out no-fest that disappoints and frustrates everyone. No, you can’t have that $700 Harry Potter Lego rocket launcher set. No, you can’t have that $70 Star Wars Naboo Lego set. No, your $5 won’t be able to buy you anything here. No, we can’t stay another three hours. I’ve also discovered that there are two types of parents. There are those organizationally-talented (OCD?) 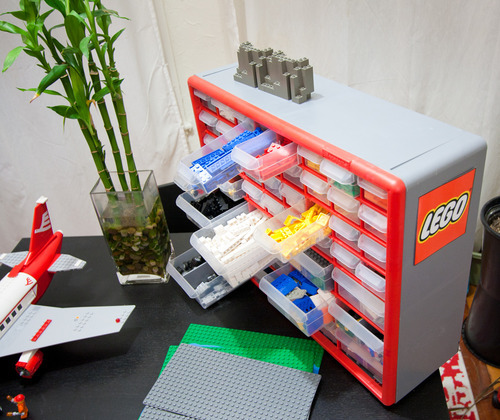 types that have the skills, equipment, time and patience to collect their kids’ gazillion Lego pieces and then meticulously sort them by color, shape, theme, character, unit, dimension and purpose into designated, purpose-built storage units. And then keep them that way, no matter how often the kids remove said Lego pieces to build their next creation. I wonder, do the parents themselves do all this sorting and organizing because they enjoy it? Because it fulfills some deep OCD need for order and control. Or is it because their kids won’t do it. Or maybe it’s because they have been pushed to the limits by all these blinking plastic pieces?! So what about those other types of parents? Well, I fall into this latter category. Yes, I am organized, and sometimes a little OCD, about other certain aspects of domesticity, like the laundry and the dishwasher. But when it comes to the Lego litter, I am tortured, completely tortured and exasperated. Every which way I turn, there’s Lego! Clean it up, you say. Not my job, I say. I am NOT going to clean up my kids’ Lego chaos. After all, it’s their mess. (I often remind them about the time that Grandma actually vacuumed up our all Legos when we were kids and she had had it with the mess! Yes, it broke her vacuum but she said the satisfaction was worth it!) So either I take a chill pill and just accept it, or I get them to clean up their own Lego mess. I’m pulling for the latter. But you’ll not find me maniacally sorting them, nor buying some expensive Lego storage unit. My kids can make do with our existing assortment of random plastic tubs. They can figure out their own system for sorting and organizing. I don’t care how as long as it’s all off the floor. And stays that way. The only challenge now is to figure how to properly bribe—I mean motivate—them! We shall see. This weekend I overheard my son telling a couple of big fat whoppers to some other kids at a party. You may call it creativity, showing off, a fib. I call it a lie: an untruth. It worries me because this is not the first big fat whopper I’ve heard out of the mouth of someone I thought was so innocent, honest, bright and un-sneaky. But it’s not. I’ve heard him telling his sister and friends small, insignificant lies. And I’ve caught him telling bold-faced lies, right to my very face. About small things, but …. I can understand boasting and showing off; peer pressure and all that. I can forgive a little creative license. But I will not tolerate down-and-out mendacity. Where does it come from? What motivates it? Every day, I try to teach my kids to be kind, to have good manners and to be happy. And very, very silly. These are the values that matter most to my husband and I and which we model. Now I realize that we have to add reinforcing and reassuring that telling the truth always trumps deception. I guess that security plays a big role in this. A child needs to understand that there is so more to be gained by spilling the beans than covertly hiding them. But don’t get me wrong, there will be also consequence when whoppers are discovered, especially if their motives are dubious. I guess I would be lying if I told you this parenting business was a cake walk. Are your kids liars? How do you handle it? I envy people who are uber-organized. I’ve tried all manner of systems and apps but none ever sticks. Ultimately it’s my non-stop-brain-ticking that keeps me and my life somewhat organized without any formal prompts or processes other than random neurons sparking and daily holy crap moments that remind me to do stuff. As I’ve written before, I exist in “wing it” mode and, so far, it’s worked. Aided by random to do lists hastily scribbled and purposefully left in places where I hopefully cannot fail to find them (in the shower, on the kitchen counter, affixed to my computer screen, stuck to my iPhone) and actually cross off some of those items. These last few days I’ve read blogs and tweets and FB posts galore about folks’ New Years resolutions—or the fact that they aren’t making any. If your resolutions are always the same (eat less, exercise more, blah, blah, blah) do they even count, I wonder? So I thought I’d try a different approach and make a 2013 to do list, right here on my blog. Yes, I know it’s a cop-out as I’m not truly resolving to do these things. But, to quote a colleague of mine, let’s consider them “directional”. Maybe with this approach, some will actually get done this year.